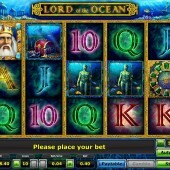 Novomatic's Lord of The Ocean online slot is one of those games anyone who visits land-based casinos will probably recognize. The striking Poseidon character, who appears on both the reels and also in the logo of the game, can not be mistaken, despite the many copycat versions of this game. Lord of The Ocean has that same classic feel of Book of Ra, without being too dated. The popularity of the game has meant the developer has wasted no time in releasing an online version of this 10-payline slot machine, which is also available on handheld devices. There are various awards for getting winning lines from left to right, with the biggest payouts coming from Poseidon himself, paying a handsome 50x line bet or 5000x your stake for a 5-of-a-kind. Descending in value is The Gate (is Wild and Scatter in Lord of The Ocean) The Mermaid, Treasure Chest, Neptune Sculpture, which make up the picture symbols. The glowing 10-to-Ace icons then make up the remaining symbols and offer the smallest pays overall. 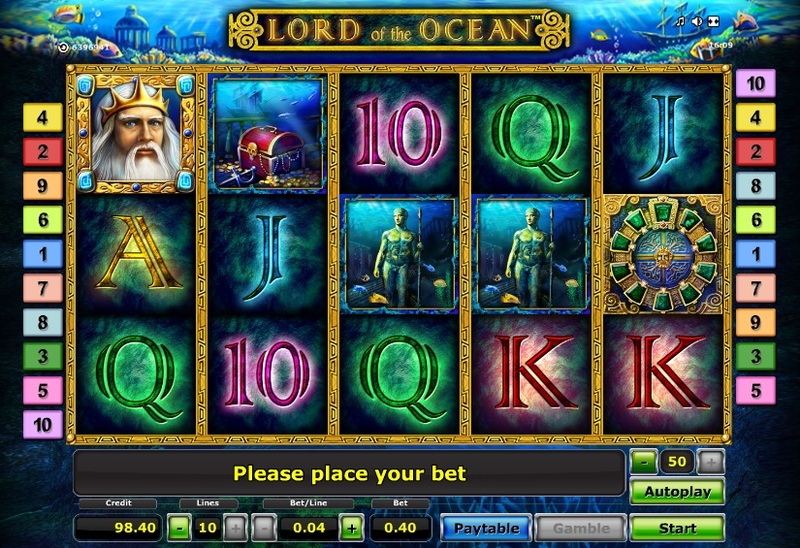 There is free spins bonus game in Lord of The Ocean which is activated by landing 3 or more gate symbol scatters anywhere on the reels. This gate then selects a special symbol for you and grants 10 free spins. If your special symbol appears during the feature then it will expand across the row it is on. Get 3 or more in view at any one time and you can be in for some nice payouts.